You’re probably thinking salad dressing. And why not? Green Goddess gets greens. But this recipe also works well as a dip or sauce. Maybe even better. Fresh herbs are the key to Green Goddess. They provide the green hue – not to mention the terrific flavor. That means summer (when herbs are at their peak) is the perfect time to make it. So serve up some Green Goddess. Then graciously accept adoration from your guests. Green Goddess was created in the 1920s, reportedly by the chef at a San Francisco restaurant. He may have invented it to honor the actor George Arliss, who was starring in a play called (what else?) The Green Goddess. The recipe is mayonnaise-based and herb heavy, typically featuring tarragon, chives, and parsley. Some versions add basil and/or spinach leaves as well. Exact measurements aren’t critical, so feel free to adjust ingredient quantities to suit your taste. This recipe takes about 15 minutes to prepare. It yields around 1½ cups of dressing/dip/sauce. You can make this recipe a couple hours ahead of time if you wish (in fact, we think it tastes better when the flavors have a chance to mingle). Leftovers keep for 2 or 3 days if refrigerated in an airtight container. Peel the garlic, chop it coarsely, then add it to a mini food processor or blender. Wash the chives, parsley leaves, and tarragon; shake them dry. Chop them all coarsely, then add them to the food processor. Add the lemon juice and anchovy paste to the food processor. Pulse a few times to begin breaking down the garlic and herbs. Add the mayonnaise and yogurt or sour cream. Pulse until you create an emulsion, with all the ingredients thoroughly combined. Add salt and pepper to taste, then pulse briefly to incorporate them into the dressing. Serve immediately. Or, better yet, place the mixture in an airtight container and refrigerate it until ready to use (we think this recipe tastes better when made a couple hours ahead of time). Tarragon vinegar is traditional in this dish, but we prefer lemon juice. Many versions of this recipe call for adding a scallion or two. We skip those, and instead use a bit more chives. Don’t have yogurt/sour cream on hand? You can skip them and just increase the amount of mayo. But we like the tang that yogurt or sour cream provides. Don’t care for anchovies? You can omit them, but you’ll be missing some of the classic Green Goddess flavor. We use kosher salt in cooking. Kosher salt is coarser than regular table salt, so it doesn’t pack a measure as tightly. That makes it less salty by volume. If substituting table salt, start with about half as much as we suggest. But always season to your taste, not ours. When we use this recipe as salad dressing, we like to mix it with a butter lettuce, such as Boston Bibb, or a lettuce with some structure, like romaine. It also works great as a dip with crudités. Or potato chips. Green Goddess is particularly tasty when served as a cold sauce with seafood or chicken. 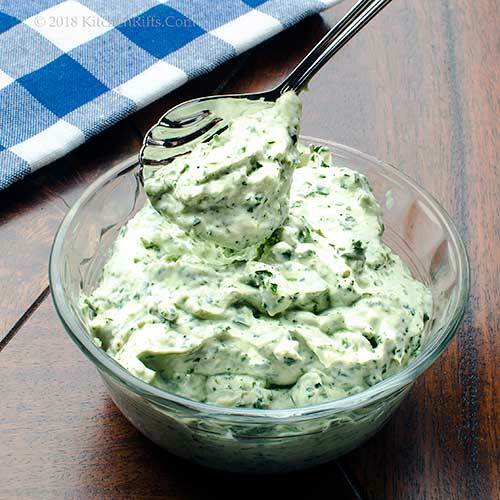 Green Goddess dressing was very popular in the 1970s and 80s. Then it faded away – perhaps because people came to associate it with the commercially prepared versions, which can be truly awful. Our recipe tastes nothing like those, we can assure you. “Maybe you should borrow a thunderbolt from Zeus,” I said. Can you say perfect timing? I not only have someone coming for dinner that I know likes creamy salad dressings but I also have herbs out the wazoo so seeing this 1st thing in the morning means it was meant to be. Thanks John! Hi Barb, this is SO good. Lucky friend. :-) Thanks for the comment. You are so right that the bad industrial product demeans the good original version. Going back to the source of Green Goddess dressing is such a good idea! Another classic that was ruined by cheap canned goods and school cafeteria cooking: chicken à la king. I hope you keep on thinking up the classics for reconsideration. Hi Mae, chicken à la king is a good dish! One I've had on my "list" of stuff to make for the blog for ages. Some of those classics are great aren't they? Classic. :-) Thanks for the comment. It looks delicious, John! I'm not crazy about the bottled version so will have to try this as it sounds very good. I will skip the anchovies but add all the rest. Sounds good and easy too. Thanks for the recipe! Lots of my favourite herbs here in this dip! I just bought a whole kilo of greek yoghurt and this is a perfect recipe to use it! Hi Pam, the bottled version really isn't very good, is it? But this is. :-) Thanks for the comment. Hi Angie, you can up the amount of yogurt in this (and reduce the mayo). Fun recipe to experiment with! Thanks for the comment. Oh, I remember how popular Green Goddess salad dressing was when I was a teen. I don't even remember what it tasted like but it was frequently in our fridge. I'm sure your homemade version, whether for salad or as a dip, is even better! Hi Liz, this is really terrific stuff -- worth trying. Much better than the bottled! Thanks for the comment. Hi Tricia, enjoy! This is SO GOOD! :-) Thanks for the comment. YUM! It looks and sounds delicious. Hi Pam, it is, it is. :-) Thanks for the comment. Store-bought green goddess dressing is never any good. Homemade is totally where it's at! This looks fabulous and it has me thinking about football season. . .how great would this be to snack on during a game? Hi Kelsie, perfect food for game day! :-) Thanks for the comment. This is a great dip! I also would prefer lemon juice over tarragon vinegar.Mostly because I’m not a huge tarragon fan! Hi Mimi, we're not fans of dried tarragon, but really like the fresh. Thanks for the comment. I love this John! A perfect accompaniment for the chopped cucumber carrot and capscium sticks with a chilled glass of sauvignon blanc. you've taken this to a new dimension and it is Blissful. This looks like the perfect dip/dressing. Love the flavors in this recipe. Hi Merryn, blissful is exactly the word. :-) Thanks for the comment. Hi Dawn, it's really good stuff! Incredibly tasty. :-) Thanks for the comment. You totally had me at... ANCHOVY PASTE!!! Hi GiGi, anchovies have terrific flavor! Love 'em. :-) Thanks for the comment. I love tarragon so I know this dressing is right up my street! Hi Caroline, tarragon is wonderful in this -- great way to feature its flavor. :-) Thanks for the comment. Hi Sherry, this actually isn't all that common in the US these days, although it's certainly around. Used to be one of the "it" dressings/dips maybe 30 or 40 years ago. Thanks for the comment. Hi Bobbi, we've definitely been slathering this on everything! Works nicely in a sandwich, too. :-) Thanks for the comment. Hi Anne, you can really taste the herbs in this. Good stuff. :-) Thanks for the comment. To be honest, I've never had green goddess anything. I remember when it was popular way back when, but the color always turned me off. Weird right? :) Thank you for bringing it back and get me thinking about it again. 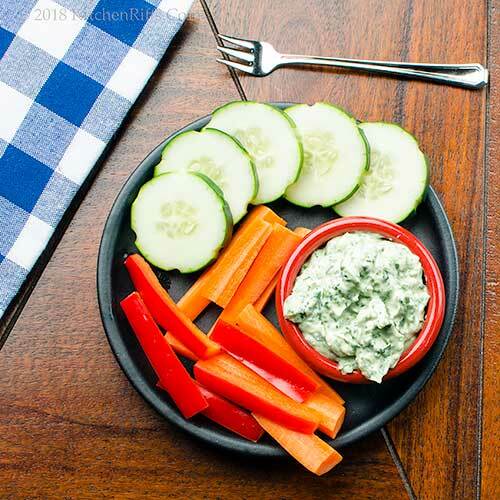 This dip sounds delicious and I can see where it would be a nice dip for fresh vegetables. I have all of the herbs growing in the garden, so what a great way to use some of them. Thanks John! Hi MJ, I figured most of us have the herbs growing -- or have easy access to them -- so thought the timing for this was ideal. And it's wonderful stuff -- we hadn't had it for decades until last year when we tasted it again, and the flavor has been haunting us ever since. Thanks for the comment. I love this dressing and I make a similar German version but I never used anchovies in mine. I have to try your version because I love anchovies. Thanks John! Hi Gerlinde, anchovies add so much depth of flavor, don't they? :-) Thanks for the comment. Loved the mix of herbs used in this recipe! This can go with any vegetables. Hi Shibi, isn't this a great combo of ingredients? And such a flexible dish! Thanks for the comment. I'm a fan of fresh "herb heavy" anything! I love this as a dip, and I think I'd also love it spread over a slice of freshly baked bread. I especially like the touch of anchovy. Yum! Hi Valentina, like the idea of using this on freshly baked bread! Have to give that a try. :-) Thanks for the comment. My father's favorite dressing is Green Goddess and do you know I've never made it? I think that's about to change! Hi Abbe, you'll love your homemade Green Goddess. Really good stuff. :-) Thanks for the comment. Green goddess is always a classic. It's great that you presented different ways to serve it. Hi Laura, there's a reason it's a classic -- it's so darn good! :-) Thanks for the comment. Well done! I know what you mean about the value of chopping off the larger stems of the parsley- it takes time but is well worth the effort! Hi Fran, those larger parsley stems are much tougher than one would think! Thanks for the comment. I actually have a whole bunch of herbs in the fridge as we speak so pretty sure this recipe is calling my name. Looks delicious John! I had no idea that this was the ingredient list for Green Goddess. I haven't had that particular dressing in a long time, but I do love it. Thanks for the recipe! John – I haven’t had green goddess dressing in a million years! It was always my favorite dressing as a kid… and my mother would make it for my birthday! (Normally, she bought it in a bottle, but birthdays were special.) 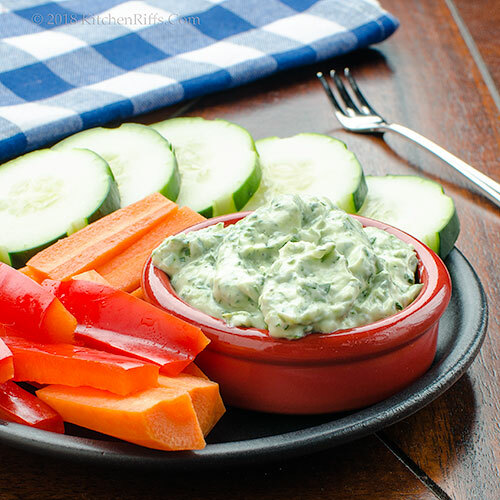 I look forward to trying this is a dip – it’s very summery, and herb garden is overflowing! Hi Simone, this recipe is definitely calling your name! :-) Thanks for the comment. Hi Jeff, bet once you starting making this dressing you'll make it often. It's really good! Thanks for the comment. Hi David, isn't this good stuff? And it's about time you had this again! Just declare today to be your birthday. :D Thanks for the comment. Hi Carolyn, anchovies are GREAT in this. :-) Thanks for the comment. Hi Kinga, it is. :-) Thanks for the comment. I must admit, when I read “Green Goddess”, memories of bottles of Kraft Green Goddess salad dressing came to mind. So glad I read on, as I have an herb garden calling for recipes just now. Looks very tasty and so much better than that store-bought stuff. Funny, I didn't really care for the bottled version we all grew up with, but now that I see what it's actually made out of, Green Goddess dressing actually sounds delicious. Totally agree it would make for a great dip. Well I never knew the origin of the Green Goddess, named like a cocktail right lol. The dip looks fabulous and I would love it as a sauce. I just did that a few weeks ago: way to many herbs in the garden, pulverized all together with oil and vinegar for marinating meat. Hi Ron, this recipe is a great way to use all those wonderful herbs in your garden. :-) Thanks for the comment. Hi Frank, the bottled stuff really isn't good. This, however, is. :-) Thanks for the comment. Hi Evelyne, it does sound like a cocktail, doesn't it? Maybe a cocktail for veggies. :-) Thanks for the comment. I can't get enough fresh herbs this time of year - they are overflowing in my garden. No tarragon this year though! 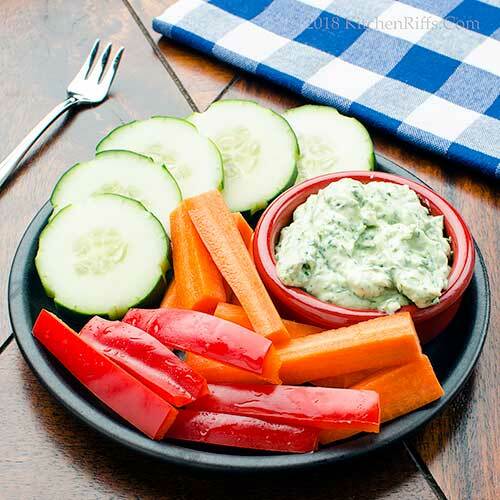 This looks delicious as a dip - perfect for fresh summer vegetables. Hi Amy, almost all of our herbs are doing really well this year. Good thing, 'cause we've been making plenty of this. :-) Thanks for the comment. John, this looks like a perfect mix of herbs! Love it! Hi Pat, isn't this such a neat dish? Loads of flavor! Thanks for the comment. Hi Greg, I've seen recipes with avocado (quite a few, actually), but yes, I think you're a rebel. :-) Thanks for the comment. Hi Rocquie, the homemade is pretty good. Excellent, I'd say. :-) Thanks for the comment. I could happily dip away at this all night. Hi Emma, this became dinner the night we made it for photos. :-) Thanks for the comment.